Yeshiva University High School for Boys is accredited by the Board of Regents of the Statue University of New York and by the Middle States Association of Secondary Schools. As such, its courses and requirements conform to the standards of the Board of Regents, and examinations in Regents subjects are given in June of each year in a number of required subjects. Students who pass all the requirements of the Board of Regents receive a New York State Regents diploma. 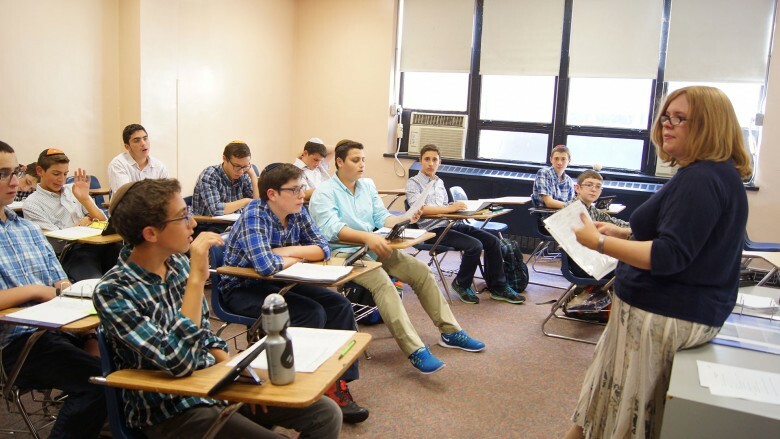 Those students who meet the more rigorous requirements of YUHSB receive a Yeshiva University High School diploma, which is approved by the Middle States Association of Secondary Schools and by the school administration with the sanction of the Yeshiva University High Schools’ Board of Trustees. It should be emphasized that Regents examinations are not the central focus of the General Studies curriculum, which is developed and evaluated by the faculty and the school leadership. Results of the Regents examinations do, however, appear on the official school transcript. All major courses (some electives excluded) are offered at two levels, Honors and Regular. Honors sections are more demanding in terms of work required and material covered. Students are placed in Honors sections according to interest and aptitude, and are given the opportunity to express their interest in the honors program during course registration each spring. The ninth-grade curriculum explores the themes of leadership, heroism, and responsibility. Introduce students to a number of classical literary allusions (e.g. Achilles’ Heel, Pandora’s Box…), phrases that are part of the language in Western Culture. In “Writing Workshop,” students have frequent, short assignments. They are expected to revise these pieces multiple times. During our examination of memoir, students will focus on writing personal essays. The Freshman vocabulary list was created to expand students vocabulary and give them the chance to write and speak critically and precisely about the works they are reading. The vocabulary list builds slowly and is cumulative. The program also works to systematically clarify commonly confused or misused words. The word clarification part of the program is also cumulative. The required summer reading of My Name is Asher Lev, by Chaim Potok (‘46) initiates the year, followed by Shooting an Elephant, by George Orwell. We begin in the Anglo-Saxon period with Beowulf followed followed by the list provided as recommended by the State University of New York. Students write two research papers and frequent expository essays as part of the ongoing writing process. Focus is on expository and persuasive writing skills. Students are taught the fundamentals of research and construction of written rhetoric. Vocabulary is taught from the studied literary works, which allows for modeling and instruction in usage. Parts of speech, punctuation, and paragraphing form the basis of instruction. English in Junior year is geared toward the development of language skills through active reading and intensive writing, and to familiarize students with a canon of literature appropriate to an independent high school. Additionally, we aim to prepare students for the English Language Regents, SAT and SAT II examinations, and for students who apply, the Advanced Placement exams ACT exam. Lastly, we seek to offer students an avenue of personal expression and offer possibility of publication. Students are assigned regularly to write expository and persuasive essays. Occasionally, students are assigned to research historical data pertaining either to the time period or philosophy of the author or characters. All juniors are assigned a Fall and Spring Reaction Paper based on a literary work. One of the goals of English in 12th grade is to refine an appreciation of literature of all genres, classic and contemporary. Additionally, we aim to stimulate conversation about the ‘self’, destiny, fate, loyalty, and social awareness, and to evaluate, debate, and inform texts that are perspectival in nature and relevant to current issues. Non-Honors Seniors are assigned a Fall and Spring Reaction Paper on a literary work fiction or non-fiction, chosen by the instructor. The writing program is designed to establish a basic structure for written expression, and encourage students to form opinion with confidence. We develop our students’ knowledge and understanding of major turning points in the shaping of world history to help them contribute to the multicultural, increasingly technological and interdependent world. Recognize major trends in historiography: Understand political and economic conflict and consensus as possible motors of history. Develop research, writing, and note-taking skills and critically analyze historical evidence. Recognize and learn to appreciate the major trends and styles in Art and Music while appreciating the pieces themselves as historical documents. Understand the political process and be able to make sound judgments and choices as active citizens of local, national and global communities. Appreciate various heritages of people throughout the world and recognize gender roles in the shaping of the modern world. Become geographically literate: learn how to use maps for geographic, economic and political analysis. This course covers the ancient, medieval, and early- modern periods, beginning with the origins of ancient religions. Topics covered in depth include Greece, Rome, the medieval conflict between church and state, the Renaissance and Reformation, the Scientific Revolution and the Enlightenment. Students are required to submit several essays in order to prepare them for the research and writing assignments in later grades. Diversified primary sources are also utilized in the classroom. The content of this course begins with the French Revolution and examines the political, social, economic, and intellectual forces that have shaped the Modern World. Other topics covered include the Industrial Revolution, Marxism, Nationalism, Imperialism, the Russian Revolution, World War I, the Rise of Fascism and Nazism, World War II and the Holocaust, the Cold War, the Fall of Communism and the rise of the third world. Students are introduced to various interpretations and primary sources in order to familiarize them with the methods and diversity of historical analysis. A research paper is required for this course, where students are expected to make use of both secondary and primary sources. Similar in content to World History II, this course places greater emphasis on key European historical issues between 1450 and the Fall of Communism. Greater attention is given to analysis of key documents in European political, social, and intellectual history. Instead of a research paper, students review for a major exam that focuses on the period 1450-1789 in preparation for the Advanced Placement Exam in May. This is a yearlong course open to those students who plan to take the AP exam in May and who obtain the approval of the Department Chair. As an intensive program of text analysis and essay writing, this course is taught in seminar format, with emphasis on an interdisciplinary approach to selected topics in 20th Century America. Students are placed in math courses based upon their achievement in elementary school and their aptitude as indicated by their transcripts and/or B.J.E. results. The department follows the New York State Regents curriculum in Algebra, Geometry, Advanced Algebra and Trigonometry. All courses integrate the use of graphing calculators into the classroom. Eac h course has been modified to include the new Common Core guidelines. Important Note: Students who have come into our school having already studied Integrated Algebra in 8th grade begin the sequence with Geometry. This course is the basic course for Grade Nine students. Among the topics taught in the first term are mathematical operations on real numbers, equation solving and related word problems, operations on monomials and polynomials, inequality solving, an introduction to geometry and the solving of equations related to geometric topics. In the second term, special products and factoring are introduced as well as the solving of quadratic equations and systems of equations. Graphing is introduced as an alternative way of solving equations. Other topics taught include statistics, variation, and operations with radicals. The theme for the course is for the student to be able to create equations which will model a situation. This course concludes with a Regents exam. This course is an extensive study of Geometry. Proving of geometric theorems and applying them are the major topics that this course will cover. Algebra related to solving geometric problems is also covered. An introduction to trigonometry is included. This course concludes with a Regents exam. The fall term begins with advanced algebra, extending the topics taught in Integrated Algebra. In addition, logarithms and complex numbers are introduced. The spring term focuses on the study of trigonometry. The graphing calculator is used to help students learn linear regression and other statistical topics. This course concludes with a Regents exam. This honors course is an elective for those students who have completed Pre Calculus or who have done exceptionally well in Algebra II & Trigonometry. Calculus AB consists of a full year of work in differential and integral calculus and related topics. At the completion of the course in May, students may take the Advanced Placement examination, credit and placement for which are offered by most colleges and universities. After the AP exam, the instructor will be covering advanced topics in Linear Algebra, series, etc. This course covers the principles and methods of statistical analysis, including descriptive statistics, probability distributions, sampling distributions, error of estimate, significance tests, correlation and regression, Chi Square and ANOVA. This honors course continues and extends the work of the AB course and prepares students for the BC examination. Six examinations for schools in New York State that measure a student’s abilities in abstract topics in mathematics. A nationwide three- hour examination for honors students who upon successful completion, qualify for the American International Mathematics Examination. Biology, Chemistry, and Physics, in addition to other exciting science electives and laboratory experiences, such as Advanced Placement (A.P) and Engineering courses. Two of these courses, Biology and Chemistry, are required courses based on standards and curricula established by the Board of Regents of the State University of New York; Regents examinations in Biology and Chemistry courses are taken at the end of the first and second year science courses. Both Biology and Chemistry courses include a weekly lab component in our new state of the art laboratory facility. The Physics Course is offered in two tracks: an Advanced Placement (A.P.) course for those with highly developed Math and Science skills and a non A.P. course for those desiring an introduction to the subject. All three subjects are highly recommended for qualified students. In addition to the core science curriculum, students may choose from our electives, which are described in the rest of this section. A one-year Course that covers in comprehensive detail all living systems and functions. There is a weekly lab component, which requires a lab report. Topics include cell theory and chemistry, human biology, organisms, plants and animals, reproduction and development, genetics and heredity, evolution and environment, and data analysis. In addition, health topics such as nutrition and proper hygiene are integrated into the curriculum. The course ends with the administration of the New York State Regents examination. The Honors College section focuses on assisting students wishing to take SAT Subject Test in Biology. This is a one–year course based on the New York State Core Curriculum for the Physical Setting/Chemistry Regents. Laboratory work is an integral component of the course and completion of the lab component is required before a student may take the Regents examination. Topics taught include matter and energy, theories of solid, liquid and gas interaction, mathematics of chemistry, nuclear and atomic chemistry, periodicity, bonding, solutions, acids, bases, salts, kinetics, equilibrium, oxidation reduction, electrochemistry, and organic chemistry. Algebraic skills are required as a significant portion of the course involves mathematical computations. The course concludes with the administration of the New York State Regents examination. Strong chemistry students who are enrolled in the Honors College Chemistry course are guided to take the SAT Subject Test in Chemistry in early June. The first in a two–year Engineering program. This course provides students with hands–on opportunities to learn meaningful science and gain practical knowledge and thinking skills that will additionally allow them to pursue higher level degrees in high–tech fields and careers. Scientific Engineering is a foundational course of study that focuses on engineering design, electrical engineering and computer science. The year begins with an introduction to the engineering mindset of analyzing technological systems and proposing solutions for current human needs, just as bridges, elevators, and indoor plumbing did for past generations. The fundamentals of electricity and electronics build an awareness of circuits, feedback systems, and control systems in preparation for learning to write computer programs to control electronic devices. Wiring, part of the C–family of computer languages, is taught and used with the Arduino microcontroller. LEGO Mindstorms Robotics, oscilloscopes, soldering irons, resistors, LED’s, solar panels, motors and many more components are used and guide students towards a final project of their choosing where they are able to utilize the design, electrical, and computer programming skills they have learned throughout the year. The course uses innovative methods of teaching and learning including in-class contests, student discovery, group work, reflection and rebuilds, teacher-student conferences, and guest experts from the engineering field. A one-year university level course wherein successful completion of the two A.P. exams (Mechanics and Electricity & Magnetism) may result in one or two semesters of college course credit. Calculus is a co-requisite. Classes meet for a double period every day; Lab sessions are held in the University’s Physics Laboratories. The course uses Differential and Integral Calculus to cover a broad sampling of Introductory Physics including Newtonian mechanics, statics and kinematics, rotational motion, oscillations. gravity, electrostatics, circuits, magnetism, induction, and Maxwell’s Equations. After the A.P. is administered in May, advanced topics such as Special Relativity, alternating current, fluid mechanics, thermal physics, waves and optics, atomic and nuclear physics introduction to Quantum Mechanics, etc. are discussed. In addition to the coursework, Lab reports are a component of the final grade. Physics is the Science of interactions among bodies and energy at their most fundamental level. This course provides students an appreciation of the application of non–calculus mathematics to solving conceptually simple problems as well as understanding the issues revolving around some of the most exciting scientific challenges of our age. The first semester covers such as the motion of particles and their interaction with energy, gravitation, behavior of forces, etc. The second semester covers Electricity and Magnetism, including circuits, Thermal Physics, Optics, and Modern Physics. For students considering taking entry–level Science at the college level, this course is strongly recommended. The primary entry criteria are a demonstrated familiarity in algebra, geometry, and simple trigonometry. The second in a two–year Engineering program. Scientific Engineering II is a multidisciplinary field that unites many engineering subjects. The course investigates fields that are at the cutting edge of research and development worldwide, and trains the students in self–study as a tool for use in the dynamic world of science and engineering; it also provides them with skills in new areas of knowledge, the ability to work in teams, independent judgment and thinking with initiative. Questions on such subjects as cloning, extension of life expectancy, bone marrow transplants, creating live cells and live tissues, experiments on humans, genetic engineering, genetic planning and so on are explored as a general framework for the possibilities of integration of engineering and biology. Units build upon the foundations of engineering design, electrical engineering, and computer science gained in the Scientific Engineering I course, and allow for advanced study of Biomechanics used for Movement Analysis and Robotics, Design of Bio-electronic monitoring instruments, Building and Training Artificial Neural Networks in their application in artificial intelligence, and the use of Nanotechnology for future transposing of DNA information to molecular electronics. A one–year university level course wherein successful completion of the A.P. Exam may result in earning college course credit. Topics include Biochemistry, energy, transport, genetics, evolution, vertebrate biology and physiology, ecology, plant life and systems. Classes meet for a double period every day; Lab sessions are held in the University’s Biology Laboratories. A one–year university level course wherein successful completion with the A.P. exam may result in college course credit. It follows the topics in Regents Chemistry course but in much greater depth and mathematical complexity. Advanced Algebraic skills are required. Classes meet for a double period every day; Lab sessions are held in the University’s Chemistry Laboratories. This is a one–year course in college–level Computer science using the Java programming language. Topics include the architecture of computers and characteristics of high–level programming languages, an introduction to Object Oriented Programming, object variables and methods, conditional execution, general class design, advanced debugging, arrays, advanced algorithms, recursion, re–use, and polymorphism. In the second semester, the Instructor determines who will be permitted to take the Computers Science “A” A.P. examination. Some previous knowledge of computers/applications is required. A solid grasp of Mathematical skills at the pre–calculus level is strongly recommended. Students are required to take Hebrew Language in 9th grade. In 10th grade, students in an honors shiur will be registered in a foreign language course of their choosing for two days a week. Students in regular tracks will be registered in a foreign language course of their choosing for four days a week. Students will take their second and third year of foreign language instruction during their junior and senior years. Instruction is centered on the development of communicative skills including listening, speaking, reading comprehension, and writing. Our aim is to help students develop an understanding and appreciation for the cultural, social, and historical background of those speaking the target language. Our language courses do not present language as an abstract linguistic system focusing solely on grammar or vocabulary in isolation. Instead, we strive to present the target language as the medium of the culture, history, and literature. For this reason, instructional methodology is both inductive and integrated in its approach, presenting concepts and skills such as grammar and vocabulary in the context of thematic readings and cultural background. In beginning and intermediate classes, the target language is used as often as possible. In advanced classes instruction is conducted almost entirely in the target language with the students required to participate in the same manner. A wide variety of techniques and strategies are employed in addition to this emphasis on oral and aural instruction. Through these strategies, students are expected to become proficient with critical listening, speaking, reading comprehension, and written expression. Target language texts used are semi–authentic and authentic. In addition to the acquisition of the basic skills of communication and the understanding of diverse cultures, we also expect our students to develop a critical appreciation of the way language is used to develop thoughts, to express ideas, and to influence others. As students progress through course levels, they are expected to build and enhance their ability to analyze literature with a sound level of sophistication and to demonstrate that understanding in written or oral expression. Students learn Hebrew language and literature in the 9th grade and have the option of continuing to study Hebrew in 10th and 11th grade. In the 12th grade, the students are offered an Ulpan elective. This independent study Hebrew literature course is organized by our award–winning teacher, Ms. Liora Haibi. Students are mentored by a renowned Israeli author with the goal of developing their Hebrew language creative writing skills. Entitled “Meet the Israeli Author”,” the program is the first of its kind in a North American Jewish high school. In part for her work on this project, Ms. Haibi received the Grinspoon award for excellence in Jewish Education in 2014. An additional period of BMK to enhance learning and the Beis Medrash experience. An additional period will allow for a more robust iyyun seder and shiur, and enable more ambitious bekius horizons and expanded machshava opportunities. After a brief history of political economy, this course introduces the student to the basic workings of the business world and the stock market. Students learn about the government’s role in the economy and influencing the business cycle. This class takes place two days a week throughout the duration of the year. Equivalent to a Psychology I course in college, AP Psychology covers topics such as the human brain, child development, thinking and language, and principles of testing. This class is designed to improve student’s ability to converse in Hebrew in preparation for studying in Israel after high school. Registration is limited and ability to play musical instrument is required. Students must try out and receive instructor’s permission for registering for this class. The class meets one time per week at lunchtime and at least one time per month at a time of mutual agreement. In addition, students occasionally rehearse outside of school in preparation for performances. The goal of the students in the class, under the supervision of a musical director, will be to form a band and perfect their abilities to play together. The fall segment of the course includes extemporaneous speaking, formal informational speeches, debate, group discussion, interview techniques and oral interpretation. Students are required to do research in preparation for the presentations. In the class the students critique each speech. The spring semester is devoted to the study of a number of play scripts. The students will select a script for presentation. Students will be involved in all facets of the production, from acting to directing to creating the scenery. This prestigious senior designation is available to up to four YUHSB seniors, chosen by the Principal and Department Head. The selected students forgo two periods of elective course work and, instead, individually meet with a designated Yeshiva College faculty advisor to collaborate on a special project agreed upon between them. Whether as lab assistant, research assistant or simply as a participant in an independent study, senior research fellows meet regularly with their Y.C. advisor. Each semester, each student makes a presentation on his progress to a super committee composed of the advisory committee, the other Senior Fellows, the YUHSB Educational Leadership, and selected other invitees. Criteria for selection include superior academic performance and standardized test scores, propensity for independent study and research, and outstanding midot. Disciplines may include: Jewish Studies, Biology, Chemistry, English, History, Math, Physics, Economics, and Music. Seniors who meet the academic requirements of an 85 average and a combined score of 1250 on the Critical Reading and math sections of SAT I exam, may be eligible to take up to four courses at Yeshiva College, the Syms School of Business and/or the Belz School of Music. There is no additional tuition charge and grades in college courses appear on both the high school transcripts, where they meet elective requirements, and on the college transcript. College credit for these courses is earned for students who will attend YC.